Mission Beach real estate is built on a sandbar. A thin rail of sand that heads North and South and is the Western-most edge of the city of San Diego. Home prices in Mission Beach vary from affordable to extravagantly unaffordable. What is consistent here in Mission Beach is the beauty of the Pacific Ocean. That’s what you’re paying for (no matter how much you pay) and that’s what you get. The unsurpassed glory of one of the most gorgeous coastlines on the entire planet. 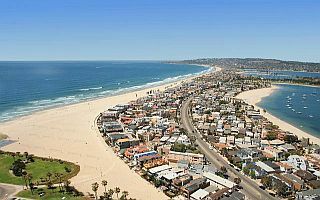 I can compare the houses in Mission Beach to the homes available in the coveted Manhattan Beach area that is part of Los Angeles County just North of San Diego. It’s that nice. Not only because the homes themselves are fantastic builds, but because the neighborhood is clean and safe. Mission Beach is an amazing community that thrives on being close knit. They have to be close, in fact. They all live on a sandbar, for crying out loud! The most amazing aspect of this neighborhood, aside from the view and the affordable homes, are the dream homes available in Mission beach. The luxury homes in Mission beach are a rare breed. They are truly “on” the beach. As in they are on the sand. You wake up with the ocean tickling your ears. You smell the salt water in the air. You can join a pick-up game of beach volleyball from your bedroom balcony if you want. For the ultra-frugal buyer looking to purchase a home in Mission Beach though, you can find some ridiculously fantastic condos. Mission Beach condos are like resort properties. You really do feel as if you could be anywhere but one of the largest cities in the United States. In fact, you might find it hard to believe you’re in the US at all. Living in one of these communities is like living full-time in a sub tropical paradise like the Florida Keys. Mission Beach has more to offer than I can get into in this short article. Suffice to say that if the living arrangements impress you, than the lifestyle will simply blow you away. Allow your next mission to be letting OpenOffer.com get you inside you’re perfect Mission Beach home.